The Algebraic Relations Solver tab of the Run Properties Editor is visible when your model contains algebraic loops that could not be solved during processing. In the tab, you can specify the tolerance of the algebraic solver algorithm. 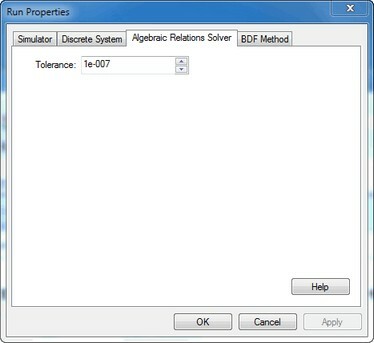 For each model evaluation, this solver tries to solve the algebraic loop relations, while standard integration algorithms, such as Euler, can be use to evaluate the model equations. The Algebraic Relations Solver tab.